Safe Houses in The Division 2 are a small safe haven that can be used to meet other players, refill ammo and get supplies. They can also be used as a waypoint for fast travel and are a respawn point should you fall in the field. Safe Houses are scattered around Washington D.C. and each comes with their own Projects attached. These Projects not only grant you Experience points when they are completed but will also unlock a Bounty in that district. Bounties normally require a currency called Intel to activate, the Bounties earned from Safe House projects however are free. These Bounties involve hunting down a named enemy and although the reward is less than normal paid bounties they are still worth doing, especially if you want to level up. Each Safe House comes with a map update which you can access by unlocking the doors of the Safe House and walking up to a laptop on the desk. Interacting with the it will reveal SHD Tech caches around the map for you to loot. These are particularly useful as they enable you to unlock skill variants and perks as you level up. At each Safe House there is a salvage station which is used to break down gear, a Bounty board to buy bounties, a matchmaking station to find allies, and a stash to store gear. 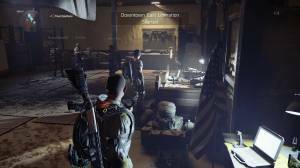 It is recommended that one of the first things you do in The Division 2 is take 45 minutes to search Washington D.C. and unlock the Safe Houses as doing so will mark all the SHD Tech caches on your map and give you easy access to each district as you play. Check out our How to Fast Travel page to find out how you can use Safe Houses to travel around the map quickly.